For the most part, the black-dyed mulch we got looks great. I had not thought to use dyed mulch before -- I generally prefer things in their natural state -- but the dark colour looks really nice and even when it fades and washes off, it leaves enough of a stain to look really impressive. What I will do differently next time we buy mulch though, is get it from Acapulco Rock and Soil, rather than buying it from the dump. The cost is higher, but the mulch from the dump has GARBAGE in it. 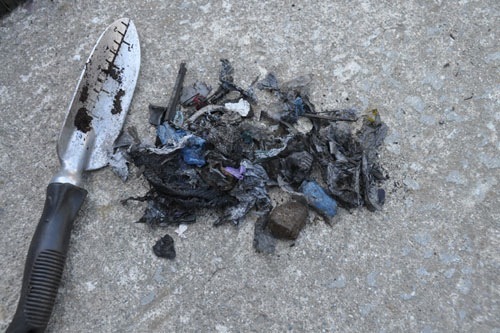 And when I say garbage, I mean, lots of pieces of chewed up plastic and debris mixed in with the wood (see above). Any large-scale sorting facility is bound to have mistakes like that, and I appreciate that Waste Management is trying to sort out and reuse as much stuff as possible, but this is a mess. I spent a couple days picking the trash out of the mulch. Luckily it tends to sort of float up to the top of the pile. Unluckily some of it was already blowing around in the yard. I'm not crazy about adding a bunch of garbage to the yard when I spend so much time carefully removing the stuff that's already here. That pile is what I got from just picking the trash up around me as I did some planting this weekend. In all I've probably removed about ten times this much from the garden and there is still plenty more to come. So next time, more money, clean mulch. Lesson learned. The dark colour does look really nice and makes things look a lot cleaner than the plain arborist wood chips ever did. What is the dye used in these kinds of things? surely non-toxic? I would have never thought of this!!! Garbage mixed in with the mulch? Did they give you a "heads-up" about this when you purchased it? I would have thought that there would have been some sort of requirement to disclose what was contained in the mulch. But as you say "Lesson learned". Did the gardners that you hired notice anything? Peggy, I admit to being kind of surprised that the gardeners were not more cautious about the mulch, but I will mention it to them. Frank, the black mulch is dyed with iron oxide which is non-toxic at this level, but will have an effect on the soil chemistry. Similarly getting compost from the dump sounds good, but I have never done it. I assume it's probably full of herbicides and whatever else people use on their lawns. A shame, really. 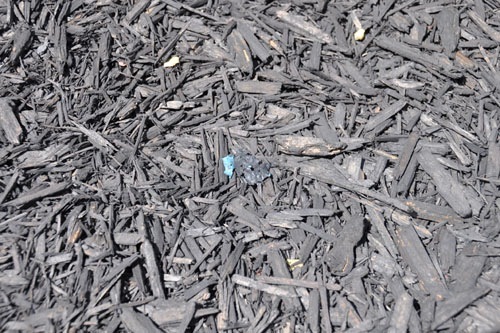 I don't see why mulch should be contaminated with plastic, however. It sounds like workers are being careless. We never bought mulch from the dump but we bought a ton of topsoil and compost from them for our first house in Oakland. There was no trash in it and WOW did we have an amazingly fertile backyard. That was 10yrs ago so maybe standards have slipped? Visited that yard recently and its still going strong. Never thought about pesticides in the compost...is it even possible to buy officially organic compost? Wow how much more would that cost? My longest comment ever I believe!